We originally focused on CDs because they are inexpensive to produce and distribute. Likewise CDs provide access where the books are not available or download speeds are too slow or expensive. 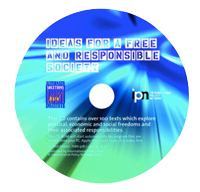 The cost of producing the second edition of our CD Ideas for a Free Society was about 75 cents each and the average cost of shipping them 20 cents. So for under a dollar we can get over 100 of these wonderful texts on the CD to almost any country. Progress far exceeded our expectations with the 100,000 copies of the 2009 2nd edition being exhausted by 2013. They were distributed by our partners to students in over 60 countries including Afghanistan, Pakistan, China, Egypt, Ethiopia, Georgia, Kyrgyzstan, Nepal, Sudan and Zimbabwe. A 3rd edition was completed in 2014 and 21,000 copies immediately dispatched to partners eagerly awaiting them for their student outreaches. More information about the projects we support can be found on the individual country pages of the this website.